Iririki Island Resort and Spa was an amazing place to stay. 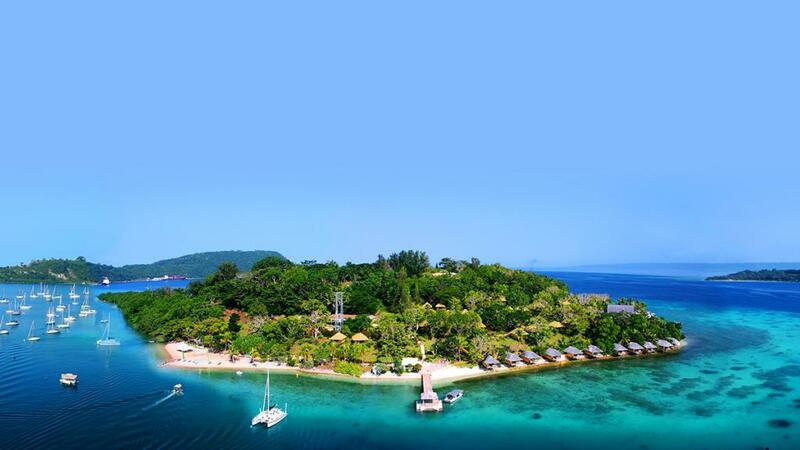 The resort itself is a 5 minute complimentary ferry ride over crystal clear, aqua, tropical fish filled water straight to Port Vila markets and tour kiosks. Our room was cleaned daily to a high standard and our view of the ocean never failed to impress. The staff were so friendly and amazing with our little boy. They remembered his name from day one and made him feel like a superstar everyday. 24/7 buggy and ferry service, the buggy picks you up right from your room and takes you to your destination at the resort. A variety of restaurants boasting a variety of different menu options perfect for couples looking for an intimate meal or families looking for something more casual. 5 pools on the island, surrounded by tropical plants and fruit trees, all very clean and the water temperature absolutely Devine. I also can’t forget the snorkelling, kayaking, casino, the spa, kids club, amazing views and ofcourse —cocktails cocktails cocktails!! The resort was a 5 star all rounder for my family and we would definitely stay here again over any other location in Port Vila. Fantastic holiday in an amazing place. The hotel was beautiful, well maintained with beautiful people working there. Nothing was too much trouble for them to ensure that you have a fantastic holiday. The rooms were modern, well maintained and we had an amazing ocean view. Will definitely go back. We went for our 30th Wedding Anniversary and had an amazing time. Iririki was beautiful. Our room had amazing views and facilities. It was very clean and the staff were very friendly and helpful ( especially Rose at reception).The snorkling was fantastic. We had a wonderful holiday. The resort is amazing and makes it very easy to relax and unwind. A delightful place and the perfect spot to just relax, unwind and enjoy the peace. Private yet close to the centre of town, hence very convenient for changing money, dining and the limited shopping available in Port Vila. Lots of variety on Iririki itself in terms of swimming venues, water sports and food/drink stops. Accommodation spacious and comfortable even though it is a little older. Staff helpful and friendly. Iririki Island Resort was fantastic. Great service, perfect location close to Port villa, tours & restaurants. Friendly staff who were very helpful. Love Vanuatu all round, second time there, Iririki Island Resort is beautiful, great recreational activities for everyone of all ages. Loved the Jet Skis at Joe's Jet Ski Hire Vanuatu! Will be back again soon! Our holiday was totally relaxing, idyllic location, beautiful accommodation and friendly staff......pure bliss! Friendly & helpful staff, great location & great facilities. Really enjoyed our worry free holiday. Had one meal at the resort and preferred to eat at the many restaurants in Port Villa. The locals are extremely friendly. We felt safe late at night. Picked a good time of year to visit as it wasn't too busy at the resort. rooms are in need of refurb are old &run down.bathrooms not very clean. The people are beautiful, food was great, and the location is stunning. Some of the rooms are a little tired & in need of a lick of paint, but they are clean & spacious, and the mattress was great. And really, with those views, who cares about the insides! Beautiful property though a little run down. Needs a bit of TLC. Ideally located close to Port Vila where there is access to a huge range of tours or do it yourself activities.Staff are lovely. Friendly and welcoming. Food at the restaurants was very good. Fresh and tasty. Plenty of breakfast though some mornings a little cold.